I still get weekly emails from University of Nicosia to resume my online MBA program. I won't be resuming the MBA having done 7 out of the 12 modules. My reason? No time. I am now super busy and letting go of many things/activities. But I have learned a lot from the MBA program. One of the most useful learning I have gotten from the MBA program is how to run business through the very strategic models/frameworks the world's big companies use. In fact, I have gotten management level projects to execute for companies that required me using the knowledge I got from the MBA program. Today, I will be sharing with you my knowledge of one of the models -- the very popular Porter's five forces. In latter posts, I will also run you through other models. I will be sharing my own application of it on my own business. Porter's five forces is a creation of Michael Porter, a Harvard Business School professor. 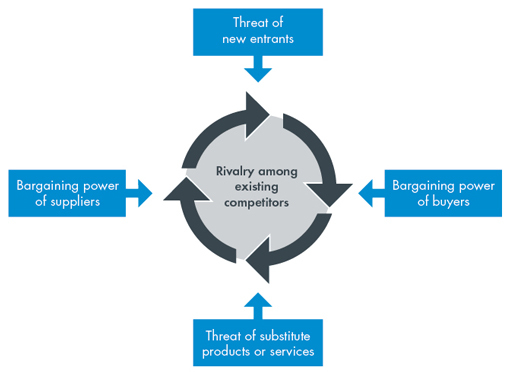 It is a strategy framework for a company to analyse its industry and competition. For my company, UrBizEdge Limited, here is the Porter's five forces analysis. As a background, my company operates in the business data analysis and Microsoft Excel consulting industry. The industry has three distinct segments -- training services, consulting and software development. There is fierce competition in the training services segment. Too many feel they are good enough to train people on Microsoft Excel. And now the creative ways many of us are using to outsmart one another is to use fancy words in marketing our training. We now no longer tag Excel training as Beginner, Intermediate and Advanced Excel. You'll now hear names like Business Data Analysis and Excel, Advanced Excel for Finance Managers, Modelling with Microsoft Excel and Business Intelligence Using Microsoft Excel. Still the market is a saturated one and it is very difficult to make very good profit. So for me, I am setting my company as a premium training service provider. I don't do price competition. I offer just one type of Microsoft Excel training (except bespoke company requested training) and play a lot more in the scalable green online training space. The consulting segment is equally very competitive but we have an edge because of our experience and high profile clientele list. But the consulting segment is the least profitable segment. Companies try to peg their payment to what they would have paid an internal full-time staff. So I now avoid consulting gigs until I have staff I can put on them. The software development segment is the most profitable and have very little competition. There have been many cases where we were the only Nigerian provider the client knows. It is the segment I am focusing more on. Again the three segments categorization applies here. Every training class I hold, there is someone asking how to break into the training and consulting segments of the industry. Those segments are constantly attracting new entrants. And there are those general practitioners companies who don't say no to whatever the client requests. They will compete with you for training and consulting projects when they don't have internal resources for them. In the words of the Blue Ocean authors, those segments are red oceans. Most of what I do is make our expertise very obvious online and project ourselves as the best value provider. The software segment is very green. Nobody wants to pay the huge price required to learn programming. The customers in the training and consulting segments have considerable bargaining power. It is not uncommon for them to threaten to go to another provider if you don't agree to their terms/price. That is what cut-throat competition causes. But for the software segment, they have very little bargaining power. Providers are so few that sometimes we are their only option. The suppliers of the industry inputs have no bargaining power, except for the companies that use external trainers and consultants to deliver the training or consulting or software project. For us, our inputs are paper, computers, projectors and food. With the recent rise of other analysis tools, those of us who are exclusively Microsoft Excel focused are seeing part of our market pie chopped off. Watch out for my next in this series. Post suggestion - Give us an update on your venture into Bitcoins. Hmm. Not so sure I have an interesting story around it. But I'll give it a try.